Whilst sheltering, Samuel realizes that he can hear the villagers’ whispered prayers to Saint Anthony – confessing lost loves, hopes and fears – and he begins to wonder if he ought to help them out a little. When Samuel’s advice hits the mark, he becomes famous, and people flock to the town to hear about their future loves. But with all the fame comes some problems, and soon Samuel has more than just the lovelorn to deal with. MY TWO CENTS: This was a great read with a little bit of everything—mystery, romance, long-lost relatives, miracles, good guys, and villains. Although it is a relatively short book, it packs a lot into the 179 pages. The village of Candeia has a presence that almost makes it another character, and certainly it goes through as many changes over the course of the story as anyone else. Readers will root for Samuel as he struggles first to simply survive, and then to understand and control his visions and power. With themes of faith, power, and destiny, this is a book to read, share and discuss for both teens and adults. TEACHING TIPS: Acioli began this book as part of a workshop with the great South American writer Gabriel García Márquez, and it would be an interesting exercise for students to compare Candeia and its residents with other insular towns in Latin American fiction. The multiple points of view in the novel are a good discussion starter and give teachers the opportunity to have students write from the point of view of different characters. The development of Candeia and the fate of the statue are a good jumping off point for discussing the changing landscape of Brazil, especially as developers and the government pour money into high profile projects and events like the World Cup and the Olympics. 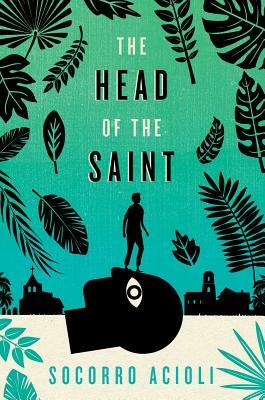 FOR MORE INFORMATION about The Head of the Saint, check your local public library, your local bookstore or IndieBound. Also, check out Goodreads, Amazon, and Barnes & Noble.